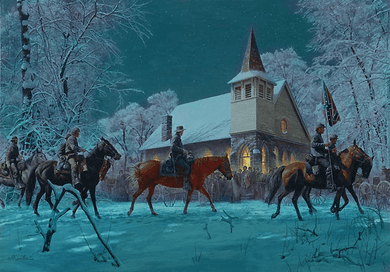 Mort Kunstler Handsigned & Numbered Masterpiece Edition Canvas Giclee:"Southern Stars "
Size: Image Size: 26" x 37"
About the Art: Southern Stars depicts a patrol of Confederate cavalry passing by historic Opequon Church near Winchester Virginia in the winter of 1862. It's a starry night, lit by the lantern-light of the church, which lends a serene hue to the snow-draped landscape. This edition is time-limited until November 1, 2007. It will be strictly limited to not exceed 100 signed and numbered giclee canvas pieces . Order today to reserve your piece of history.